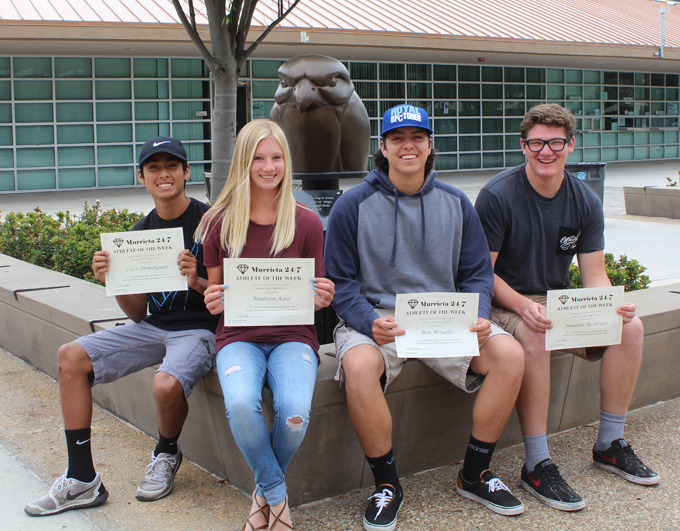 From left: Cisco Dominguez, Madison Kast, Ben Moralez, Hayden McIntyre. Freshman Madison Kast has been honored for the third time this track and field season. She has improved by at least eight inches in the pole vault in recent weeks, clearing a personal best height of 10-8 at the Southwestern League finals. She will compete in the CIF prelims this weekend. Senior Hayden McIntyre of the boys track team improved his season best to 148-6 in the discus to place fifth overall in league finals. Ben Moralez pitched a complete-game victory over Temecula Valley for the Nighthawks baseball team. Cisco Dominguez of the boys lacrosse team is a varsity midfielder who is "our go-to guy for faceoffs," said his coach, Chris Cornils. "He also excels at both offensive and defensive middle."